My Cousin Rachel, the last story in du Maurier’s ‘Four Great Cornish Novels’ collection and a brilliant one to finish on. After reading Frenchman’s Creek, I was slightly apprehensive about the final book in the collection. I wasn’t sure what to expect, but it turns out there was no need to worry. 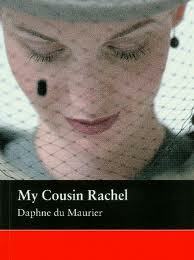 My Cousin Rachel brought back that shiver-down-my-spine feeling that kept me on edge all through Rebecca. I did not find the novel as enjoyable as Rebecca, because I could not fully relax while reading it. My opinions of the characters were constantly changing and even now that I have finished, I’m not too sure how I feel about either the awkward narrator or the woman who he obsesses over for the majority of the book. Philip, the narrator, is a young man who has no experience with women, apart from time spent with his childhood friend Louise. Growing up in a large, musty house with only his guardian, Ambrose, who taught him the alphabet through swear words, and all male servants, he is not well prepared when his cousin Rachel, Ambrose’s widow, comes to stay. Ambrose and Rachel met and married in Italy, where they stayed until Ambrose’s sudden death. Having never met Rachel, Philip has wildly different pictures of her in his minds eye. Sometimes he imagines her to be young, elegant and manipulative, sometimes she is old, fat and grumpy. But always, he feels the same pang of jealousy when he thinks about her. When he receives distressing and confusing letters from Ambrose before his death, Philip’s jealousy turns to mistrust and when he learns that Ambrose has passed away, all of his feelings turn to hatred towards his cousin Rachel. When Rachel arrives, weeks after Ambrose’s death, everything changes. The house, no longer dusty and bare, is transformed and expensive ornaments, which Philip did not know even existed, are dug out and polished. Even the servants walk around with a new flourish, proud to welcome the new ‘mistress’. Philip’s feeling also change, his obsessive hatred for the Rachel of his imaginations, warps into a new kind of obsession, which could end up being far more dangerous. Jealousy is a strong theme throughout My Cousin Rachel, showing a human weakness that creates bitter, unhappy and unstable characters. It also makes the book an uncomfortable read, and a roller-coaster of emotions, constantly making you wonder what will happen next and where all of these suppressed feelings will lead. Although not a relaxing read, I found this novel an interesting insight into human emotions and the differences between men and women. Philip’s inexperience is both endearing and irritating and makes for some very touching moments as well as lots of cringing situations. Haha, that is the question isn’t it!? It’s a ‘did she or didn’t she?’ book which I suppose can be a bit unsatisfying! I remember reading this in college (not for a class) and being really obsessed with it. A lot of the details are lost on me now, but I do remember the shiver down the spine feeling.. I think I lent my copy to a friend because I knew she’d read it and talk to me about it! It does have that uneasy feeling creeping up on you as you read it! It isn’t quite so obvious what makes you feel quite so on edge through this book compared to Rebecca, but I think that’s one of the reasons I liked it so much! I’ve never read a Daphne du Maurier book and you’ve inspired me to add some to my reading list. I’ll definitely have to start with Rebecca. Oh good! Rebecca is a good one to start with! Happy Reading! Let me know what you think.